I went to an interesting seminar last week at HEC Montréal (Hautes Études Commerciales, business school affiliated with the University of Montreal) on pedagogical methods and trends in the teaching of entrepreneurship. Highly diverse and enthusiastic bunch, willing to share their teaching methods, tricks, and challenges. That brought me back to my long experience as an Industrial Technology Advisor with the National Research Council’s Industrial Research Assistance Program (IRAP). IRAP’s mission is to help Canadian companies grow stronger, faster and bigger with innovation and technology. A lot of my client SMEs (in several parts of the country) were high-tech start-ups with little more than basic stuff, few people, even fewer financial resources but with a great idea partially developed into a product/process/service. I recall in particular a minimalist biotech start-up that had a sheet of plywood and two saw horses as a conference table… but talk about knowledge and advanced IT systems in that firm… In any case, my point is that most of these firms were led by engineers or scientists with few resources, if any, to hire personnel to complement their skill-sets. 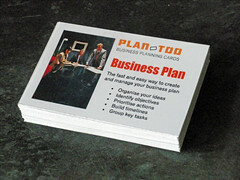 Not surprisingly, they were often at a loss as to what to include in a business plan and how to go about it…. I would get comments like: ‘but Diane, what do YOU want to see in this business plan?’ well…. that was not MY business plan nor MY firm….. Most of them had a fairly good vision of what they were trying to accomplish and most importantly, how, but packaging this into a detailed business plans with market and financial forecasts what a challenge, to say the very least. Some hired consultants to do it so that they could satisfy a variety of demands (government programs, lenders, etc). They obviously did not ‘own’ the plan then as it was prepared by someone else. I’m not saying that a business plan is useless… But my observations are that it generally takes way too long for business people to put a traditional business plan together, often with mediocre results, and obviously it becomes obsolete as soon as Print is pressed on a keyboard, if not sooner….. Yet, the pace of everything is so much faster that if we want our Canadian firms to succeed in this global world, there’s got to be a better way… So it is refreshing to see new trends along the lines of developing the opportunity (Kawasaki, Ries etc), and new approaches to teach entrepreneurship. What do you think? any direct/indirect experience with business plans for start-ups? let’s hear it!